PRISM Furniture and More is in the Home and Garden Market Summer Fair (June 23 - June 29). There are some great creations in the shop, a gift by the door, some promos, and 3 apples with very nice hunt prizes, see them in the picture above, aren't they pretty? 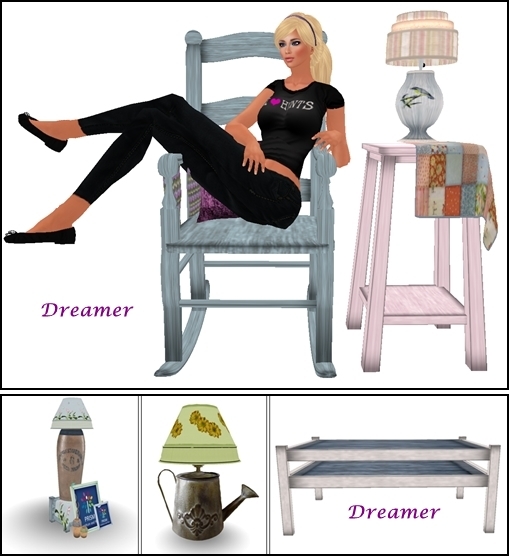 They are lovely, but my favourite is the blue robin set on top (rocker with several sitting options, lamp and end table). That one is not a gift, but it is sooo beautiful. Just looking at it relaxes me. Go to the shop, have a look around, get the gift, find the apples... have fun.